This thread (and the 63 that have preceded it) is for all things that relate to Classical Music. Feel free to post what you're listening to, recordings you recommend, recent classical purchases, classical concerts, classical works, classical composers or classical performers. In a minimalist mood. Last night I heard a recital that included Part's Spiegel im Spiegel. Tonight I listened to Feldman's Piano and String Quartet (performed by Takahashi and Kronos). That 4th Symphony certainly is. I am very fond of Bernstein's collaboration with Andre Watts in the Second Piano Concerto. George, just before turning the thread over you mentioned a growing fondness for Brahms. Here's an interesting tidbit: the first conductor to record all four Brahms syms. was none other than Leopold Stokowski, and, his reputation notwithstanding, they are remarkably unidiosyncratic performances (if that's a word). Walter H and bluemooze like this. My Juilliard professor wants to do a whole semester on Brahms next fall. My fingers are crossed that there will be enough interest expressed. Mik, Robin L and George P like this. for 23 British pounds = $37. Does anyone know when the Pierre Monteux Complete RCA Recordings box set will be issued domestically in the USA? Presently only available as import from what I can find. Stokowski was one of the greats, wasn't he? And I happen to be a fan of idiosyncratic performances. EasterEverywhere, jukes and Robin L like this. Definitely. And so am I--just noting that when he wanted to, Stokowski could deliver a terrific "central" type reading, too. Quite the orchestral magician, that one was. EasterEverywhere and Robin L like this. Even Celibidache had some good things to say about him (and he was the guy who hated virtually every single conductor in the world except Furtwangler). I have been enjoying the Bernstein symphony box very much. I don't have the extensive listening experience that many of our thread participants do, but to me he's great. Robin L and john greenwood like this. M.Deutrom, Pericles, bluemooze and 4 others like this. Tempting. I'm not that big a Wagner fan, and I have two versions of "The Ring" already - one audio (Janowski on Sony), one video (Levine at the Met). I passed on the Solti Wagner box, which wasn't that much more. But maybe if I can find a discount . . . I have earlier releases of the symphonies and the German Requiem. Both very satisfying. 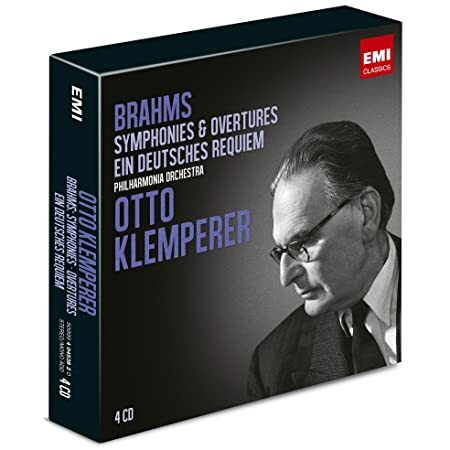 I'm hoping that the re-release of the Szell Brahms that I ordered from CDJapan will show up one of these days - and that it will be an improved remastering. Coffee and Handel. Concerti Grossi with Marriner/ASMF. There are vendors on Amazon selling the Solti/Wagner box (all the major operas including the Ring) new for about $80 including shipping. Apparently the librettos are on a CD-ROM. So unless the Blu-Ray is has improved sound through remastering and/or hi-res, the box sounds like the better value. marcel, Soulpope, bluemooze and 3 others like this. One of the Maestro's last Phase 4 recordings is a straightforward rendering of Brahms' First Symphony with the LSO. Stokowski was a showman but he was also very skilled, and he seemed to get out of the way of many of the "Heavy" scores, like Sibelius' Fourth Symphony. I'll have to pull out the Phase 4/Stokowski box again, there's a recording of Beethoven's Fifth that is unusual and very interesting. This used to be my favorite recording of the piece for a long time, but nowadays it feels to me a bit too slow, especially the first movement. But still, this is one of the most beautifully recorded and played performances of the seventh out there.